I stumbled across a record today, a new record on Ancestry. It is actually a very old one even though it is new to me. I never even suspected that this record existed because Benjamin C. Foster was born in 1797. In my mind, he was a little too young to have served in the War of 1812. 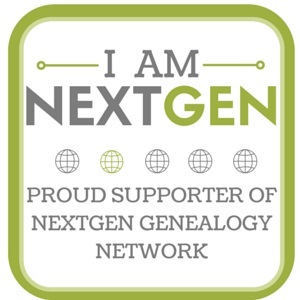 In case you haven’t been following the genealogy news this last year, Fold3, Ancestry and the National Archives have been working on a project to digitize the War of 1812 pension records. The plan is to make the records available to everyone….for FREE. The project is only 12% complete at this point. So while I found this index card today (which has made me extremely excited), I have to wait because the actual pension file has not been digitized yet. Patience is a virtue, right? This entry was posted in Foster and tagged Belinda (Barker) Foster, Benjamin Coates Foster, genealogy, War of 1812 on November 22, 2013 by Deborah Sweeney. This entry was posted in Foster, Genealogy, World War II, World War II Letters, Yegerlehner and tagged Belinda (Barker) Foster, genealogy, Gladys R. (Foster) Yegerlehner, J. M. Roberts, John F. Yegerlehner, Mark A. Yegerlehner, Roscoe S. Yegerlehner, World War II, World War II letters on March 14, 2013 by Deborah Sweeney. The Foster Family, by The American Genealogical Research Institite, 1973. Many years ago I was given a copy of the book The Foster Family from the American Genealogical Research Institute. The book is copyrighted 1973 and it does not specify whether there were multiple printings or additions. I know the book was given to me by a well meaning relative but I don’t remember who at this point. The book has several chapters ranging from “the family name and arms”, “census of 1790” and “constructing the foster family tree”. And before you comment upon my lack of capitalization, I am copying straight from the book. Books like this are great for the novice genealogist, I guess. But even when I received the book, I already knew how useless it was for my own research. Books like this are mere grandiose summaries. They talk big, but they have no meat as they are comprised mostly of lists. And since the book was written in 1973, much of the information is likely inaccurate and obsolete. One fascinating aspect of the book is the first section “the family name and arms”. It gives a brief history of Europe, which starts laughingly with the collapse of the Roman Empire and the waves of Barbarians sweeping across Europe in the 4th and 5th centuries. Wow! Really, how does this help me trace my Foster family? The narrative continues with the Norman Invasion in 1066 and then engages in a mini lecture on the evolutionary nature of names. According to the book, Foster was originally Forrester. The title of Forrester was given by the Saxons to men appointed to guard the forests and to protect the Lord’s hunting rights. Over time the name Forrester evolved to Forster and then Foster. That may be, but how does that help me trace the lineage of one Gladys Foster, born 1905 in Terre Haute, Indiana. Frankly, it does not. There are multiple origins of the name Foster. What about those individuals who “fostered” children? Or, I like this French version “Shearer or scissors maker” from the Old French “forceter”. Regardless of the actual history of my Foster family, I am sure it has little to do with this pompous tourist brochure that now takes up precious space on my bookshelf. I guess it is good for a laugh or two. I was lucky enough to inherit a lineage chart that was written in my grandmother’s handwriting that traced her father’s family. The chart names all of my great grandfather’s siblings and his parents. Considering my grandmother never spoke about her father or his family, it is rather fortunate that the chart even existed. My great grandfather was James Edward “Ned” Foster whose father was James Benjamin Foster whose father was Benjamin Coates Foster. And that, ladies and gentleman, is the end of the line, the brick wall of my Foster family. I have traced the line back as far as my 3rd great grandfather, six generations. That’s decent by some standards, but not good enough by mine. I’ve hit that proverbial brick wall because of those early waves of western migration that brought young Americans from the coastal states to the new territories of Ohio, Indiana and Illinois and the lack of proper recordkeeping. Benjamin Coates Foster was born April 13, 1797 in Pennsylvania. Yeah, Pennsylvania! No county, just Pennsylvania. On the 1800 census, there were 602,365 people enumerated in Pennsylvania. There were at least 68 heads of household with the surname Foster. (I got this figure from Ancestry so we also have to allow for entries misspelled in the index). 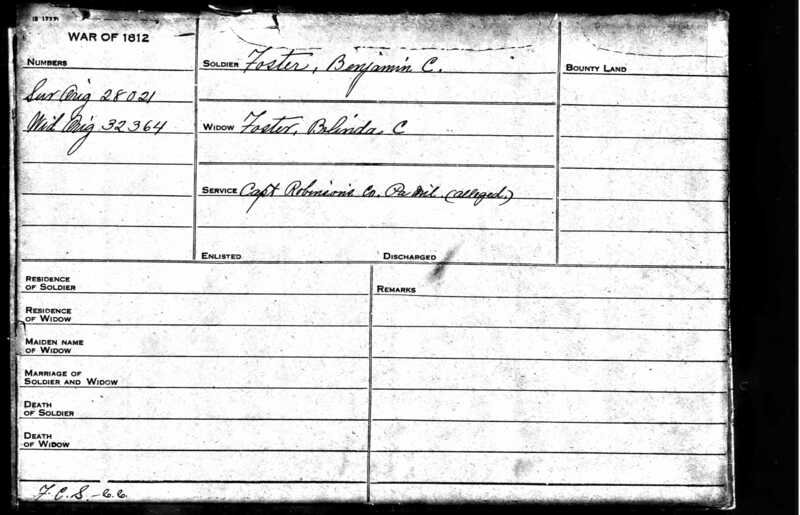 The first time I can legitimately find Benjamin C. Foster on a document is his marriage on March 28, 1828 in Lawrence County, Illinois to Belinda Barker. He appears on the 1830 census in nearby Clark County, Illinois where he remained the rest of his life. In 1838 and 1839, there were several land purchases in Clark County. Benjamin can be found on the United States censuses for 1830, 1840, 1850, 1860, and 1870 in Clark County. I have also found him on the Illinois State censuses of 1855 and 1865. One of my favorite things that I learned about Benjamin from the 1850 and 1860 censuses is that Benjamin’s occupation was a tailor! For those of you that don’t know me, I am also a seamstress and pattern maker so it is nice to know that such things are in my genes. This is also why I like the French translation of Foster since it has to do with scissors. Benjamin and Belinda were blessed with at least 9 children, of which only 6 survived to adulthood, and of those only 4 had children to pass on the genes, 2 were male, leaving my 2nd great grandfather James B. Foster the only child of Benjamin and Belinda to have any male children to pass on the surname of Foster. James L. Foster in his sailor uniform. Photograph courtesy of Gerry McCarroll. I believe this is one of the last letters I have from Uncle Jim for awhile. It is good to know that eventually the brothers-in-law will meet up. Just today received a letter from Jake, he wanted me to meet him last night at the Y.M.C.A., mail is not so fast here as you can reddily see, anyway I wrote him and I think we will be able to get together soon. Please let me know when you plan coming for sure I will try to get two or three nights away if you want me to, if that won’t interfere with your plans, maybe we can have a grand party, or something. Anyway I will get to see you at least once, I am writing to find out if Thelma is going to get a vacation, if she does I will have her down here for a week or two. It won’t be in June I am most sure of that, but sometime later. Hello John and Mark, you should see your uncle Jim in a sailor uniform. 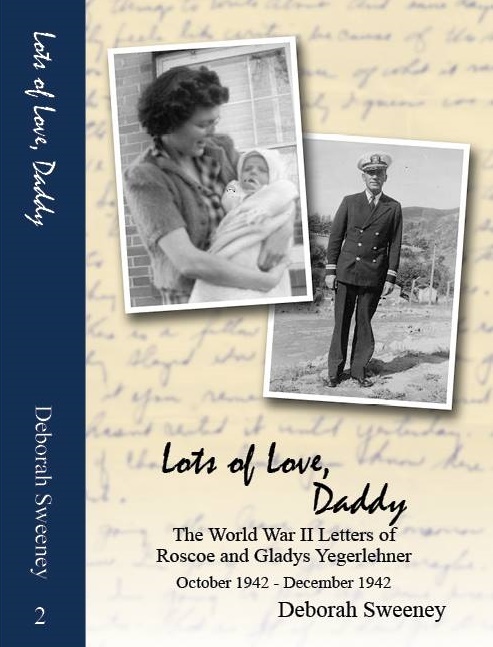 This entry was posted in Foster, Genealogy, Surname Saturday, Uncategorized, World War II, World War II Letters, Yegerlehner and tagged Belinda (Barker) Foster, Benjamin Coates Foster, Gladys R. (Foster) Yegerlehner, James Benjamin Foster, James E. Foster, James L. Foster, John F. Yegerlehner, Lydia Catherine (Dicks) Foster, Mark A. Yegerlehner, Roscoe S. Yegerlehner, Thelma (Mayrose) Foster on December 15, 2012 by Deborah Sweeney.